According to research done by Mars Veterinary, mixed breeds account for about 53 percent of dogs kept as pets. Some of these "mutts" or "designer dogs" appear to have become as popular as some purebreeds. According to Animal Planet, the first six dogs on this list are among the top designer dogs. However, it should be noted that there isn't a single, verifiable list that qualifies which crossbreeds are truly the most popular. LoveToKnow editors have chosen the Cockapoo, a perennial favorite, as well as the Maltipoo and Schnoodle as worthy additions to this list. In the end, which breed is most popular still comes down to a matter of personal opinion, but you can use this list to help you search for a mixed breed companion that may be the best fit for your lifestyle . Cavachon: The Cavachon is a cross between a Cavalier King Charles Spaniel and a Bichon Frise. The result is a fluffy, happy-go-lucky small dog that desires close companionship with its human family. Chiweenie: The Chiweenie is a cross between a Chihuahua and a Dachshund. It has the long body and short legs of a Dachshund, but the face and size of a Chihuahua. Ears can be floppy or pointy. This dog is smart, stubborn and likes people. Chorkie: Chorkies come from a cross between the Chihuahua and the Yorkshire Terrier. The result is an energetic little dog with a happy attitude and tendency to bark a lot. Chorkies are too small and delicate to be companions for very young children, but they do make nice pets for families with older children who understand the need to be gentle with these little dogs. Goldendoodle: Also called Goldie Poo or a Groodle, this crossbreed has the temperament and intelligence of a Golden Retriever and the hypoallergenic, non-shedding fur of a Poodle. Labradoodle: Celebrities such as Tiger Woods and Jennifer Aniston own this crossbreed, which is a mix between a Labrador Retriever and a Poodle. The dogs as a rule are happy, outgoing, smart and have less allergens than other breeds. Puggle: Puggles are made by breeding a Pug and a Beagle. The result is a dog with a Beagle's body and a Pug's coloring. They are good family dogs - smart, but a bit hard to train. They are medium size and weigh 12 to 30 pounds. Cockapoo: The Cockapoo is a mix between Cocker Spaniel and Poodle. 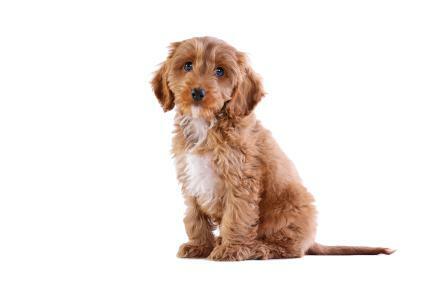 Made up of two of the AKC's top breeds, this mix creates a dog that has the floppy ears and outgoing nature of the Cocker Spaniel, but the non-shedding coat of the Poodle. Maltipoo: This dog is a cross of a Maltese and a Poodle. They want to please their owners and tend to love children. Maltapoos come in three sizes, depending upon the size of the parents bred together. Sizes include toy, tiny toy and teacup. Schnoodle: Not a purebred dog, but a mix between two pure breeds, the Schnauzer and the Poodle, Schnoodles are so adorable they look almost like a stuffed animal toy. These open and friendly dogs, and their size varies depending the size of the parents since both Poodles and Schnauzers come in three sizes. It's interesting to note that Mars Veterinary created a dog DNA test called the Wisdom Panel DNA test to help reveal the breed heritage behind many mixed breeds. Mars collected DNA from mixed breed dogs across the United States and found that the most common breed shared amongst mutts was the German Shepherd. Here is a full list of the top breeds found in the DNA of mixed dogs in the United States and the traits each breed brings to the mix. German Shepherd: This breed is often chosen by law enforcement because of its high intelligence and easy trainability. Labrador Retriever: Labradors are full of energy, love children and make excellent sporting dogs. Chow Chow: Chows are intelligent, stubborn and protective. They aren't always great with children, but they can be bred with other breeds that do love children. Boxer: This breed has tons of energy and is easy to groom and gentle with children. Rottweiler: Rottweilers are sturdy dogs that are perfect to use as service dogs. These traits are maintained when mixed with other breeds. Poodle: Poodles are a popular breed in crossbreeds because of their fairly hypoallergenic coats. Some of the health issues Poodles deal with can also be lessened by crossbreeding. American Staffordshire Terrier: Staffordshires are strong, stocky dogs that resemble Pitbulls in appearance. They are highly intelligent and love people. Golden Retriever: Golden Retrievers are excellent family dogs; they're loyal and love water. Cocker Spaniel: Cocker Spaniels are smart and medium to small in size. By breeding them with another breed, some temperament issues associated with the breed are diffused. Siberian Husky: Having a bit of Husky in its DNA is desirable in a mixed breed dog. Huskies are strong, energetic and excellent companions. Designer breeds are available through breeders and rescue organizations. Some people question the ethics of spending hundreds of dollars on a designer dog which is essentially a mixed breed. Only you can determine if this is the right choice for your family. For someone who desires the traits of a particular breed with the lesser allergens of a Poodle, a mixed Poodle breed might be worth the extra money. Wherever you decide to search for a mixed breed dog, take the time to ask yourself whether or not a specific dog is right for your family and whether your family is right for the dog.